IBASSIN: Bradford Beavers Wins 2017 Costa FLW Series Championship with 45-12bs! Bradford Beavers Wins 2017 Costa FLW Series Championship with 45-12bs! On a tough and topsy-turvy Kentucky Lake, Bradford Beavers ground out about 15 pounds per day and came away with his first big win in the Costa FLW Series Championship. 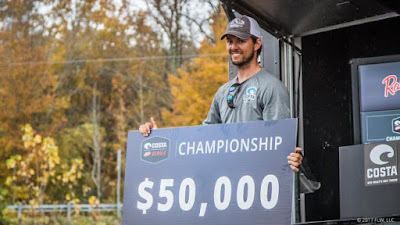 Totaling up 15 bass for 45 pounds, 12 ounces, the up-and-coming Ridgeville, S.C., pro earned a $50,000 prize package and qualified for the Forrest Wood Cup for the second year in a row. Beavers started decently and managed to stay consistent every day, basically playing the shallow bar game that Kentucky Lake is known for in the fall. He essentially had two or three spots that produced for him the whole tournament, with one real sweet spot, and he found them all on the last day of practice just north of New Johnsonville. Beavers’ three spots were nothing too remarkable – shallow bars (one with some stumps, two without) on the main lake, but not right on the channel. Beavers estimates he caught most of his fish in less than 2 feet of water. Though the places were unremarkable, he did try and avoid pressure somewhat by staying on the back of his bars, where he figured fewer people had gotten to, and he also tried to be super stealthy. Beavers did the majority of his damage off one bar the first two days. On the final day, he split his efforts between it and his third spot. Throwing a bone and chrome-colored Heddon Zara Spook accounted for his fish on days one and two, but he made a key change to a pearl white Zoom Magnum Fluke midway through the final day. Starting out with his Fluke simply Texas-rigged worked for one fish, but adding a treble hook as a trailer was the change that enabled Beavers to win. After finishing out his best spot, he moved on to spot No. 3 and finished his limit and culled with a 4-pounder. FLW awarded 11 spots in the 2018 Forrest Wood Cup to top finishers at the Costa FLW Series Championship. The first six went to the highest finishing pros from the five U.S. divisions and the International Division. The remaining five went to the next five highest finishing pros regardless of division. Bryan Thrift, who already qualified for the 2018 Cup for winning the 2017 FLW Tour Angler of the Year, earned a double qualification, and so FLW extended an additional Cup invitation to the next angler down the standings at the Costa FLW Series Championship.